We look to the best experts to inform our care guidelines for patients and care providers. Our Scientific Advisory Council (SAC) is made up of experts in Osteoporosis and Bone Metabolism. Comprised of clinicians, researchers and educators, the SAC advises Osteoporosis Canada’s board and staff on scientific and medical issues. Osteoporosis Canada will be releasing updated Osteoporosis Management Clinical Guidelines in the fall of 2019. Along with a steering committee, working groups have been established including: risk assessment, pharmacotherapy, exercise and nutrition. There is also a stakeholder committee and a Conflict of Interest monitoring committee. A primary care physician and a member of the Canadian Osteoporosis Patient Network (COPN) are integral members of each committee to ensure all voices are heard. Mr. Larry Funnell, a long time Osteoporosis Canada volunteer, and Dr. Suzanne Morin, a member of Osteoporosis Canada’s Scientific Advisory Council, presented “Patient Engagement in Clinical Guidelines Development : Input from >1000 Members of the Canadian Osteoporosis Patient Network” at the IOF ESCEO Conference being held in Paris, France. Larry can be seen here at the podium delivering his presentation. Congratulations to both Larry and Dr. Morin. 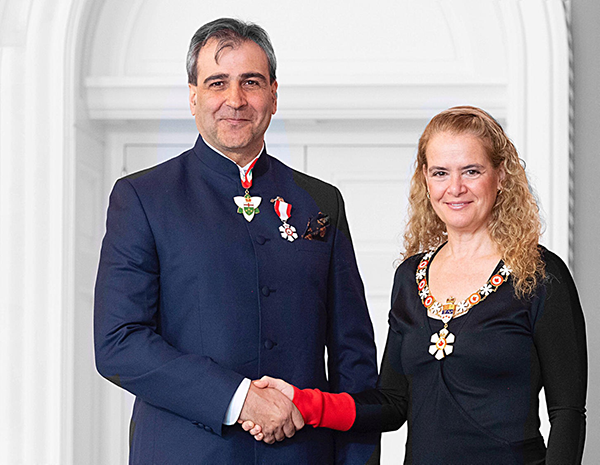 Dr. Mohit Bhandari, a member of the SAC Executive committee, a Professor in the Department of Surgery at McMaster University and a leader in the field of orthopedic surgery has been invested into the Order of Canada, one of the highest civilian honours in Canada. Mohit has been recognized for his advocacy on behalf of domestic violence victims. Osteoporosis Canada is aware of the following recent media releases.